The main reason I am posting this is in my years of consulting I’m often asked how to prepare for Citrix Synergy, and because I’m a consultant I will typically say “It Depends” because like most things it does. But let’s try to run down the basics that apply to most. For 2018- I am actually arriving Sunday even though it doesn’t start until Tuesday. Why? For me the flight was so much cheaper it was better to arrive Sunday and have the extra day of hotel; and I have a Monday 9am CTA briefing that I didn’t feel like fighting a flight to get there in time. Some others may just want the extra time to be social, which is awesome! In 2018 we are having a CUGC Pre-Game 4:30 pm on Monday (the night before Synergy begins). So if you are there Monday night you should register and I’ll see you there! If your company is paying… book the conference hotels. Having the ability to easily get to your room is often a good thing for dropping off SWAG or just a quick nap before hitting the next big event. You’ll generally survive better and be better able to respond to those panic emails with a close by place to go. If you are paying- you’ll save a lot of money at some of the off-brand hotels within either walking or Uber distance. If you are paying your own way to #CitrixSynergy - there are affordable hotels within walking distance. More tips at CTXPro.com! Click To TweetIn 2017 I saved some $300 despite using a combination of Uber and Lyft to get back and forth to the hotel each day. Here, let me help: Here’s a code for $5 of Uber. Just be ready for a bit more walking and thinking ahead; you’ll be fine! The end-of-Synergy party is usually filled with opportunities to stay out even later once the party is closed. So ask yourself… will you be feeling it the next day? Do you enjoy traveling like that? Are there other things you could do to take advantage of the trip? For example, 2018 will be right by Disneyland… it makes for an interesting reason to stay and relax for a few more days! So- the classic question: what am I bringing to Anaheim? And how does it compare to last year’s list? Your choice of airline will drastically impact your choice for luggage. Some allow carryons with virtually no questions asked. Some are getting picky. Some will allow you to check a bag for free… some will not. Second- There’s some key things to remember regardless and I have a few rules when it comes to events like Synergy. Layer your clothing. This is key with any conference because modus operandi is to keep every room at about 65 degrees. I’m not kidding. Because you never know just how many hot-air spewing geeks will really be present (with apologies to hot-air spewing geeks) conference centers err on the side of caution and keep ahead of the temperature increases. SO- layering is key. Be mindful of how long you are there. I always plan for the typical underwear/socks combo for N+1 days. It’s lightweight redundancy. But your quantity of shirts, pants, dresses, etc will be determined by this. Noone will remember what you wore yesterday. This seems a bit an odd suggestion, but to keep what you pack to a minimum for a 4 day visit, I’d suggest packing at least 3 main top layers and 3 bottom layers and rotating them to bottom. This allows enough rotation to keep it interesting without having to worry about repetition. You’ll be getting extra top layers there if you’re a t-shirt person… so plan ahead! If you are NOT a t-shirt person… look at my list for a specific suggestion. Just don’t plan on wearing new t-shirts under anything else. #itchy The second set of advice here- if at all possible- favor denim over dress pants. You can take a lot less that way. The Second Laptop Bag can be used for additional storage. You will get a laptop bag when you register. So what do you bring your laptop in for the trip? In years past I have decided to check my main bag and use the second laptop bag for additional carry-on (most US carriers allow two carryons). However… see below for what I’m thinking laptop wise this year! I will only be bringing a carry on bag and NOT my usual laptop bag. In years past I was traveling with a laptop that was too large to fit the conference bag- but in late 2017 I upgraded to a Dell Precision 15″ that is much lighter and skinnier (much like this model at my affiliate, Amazon: https://amzn.to/2qo0CCS). The set I use is a previous model of this one that features a easy expansion if it’s needed. I’ll be able to use the conference bag to haul my laptop about if needed for labs. Sorry this guide is very male-focused; if you have a perspective from the more-fair gender I would LOVE to include your advice- message me with your details! Under-Shirts: Consider past years’ CUGC T-Shirts- these can serve double duty first as outer layers, then as under layers. I had room this year to go with classic v-neck undershirts. If you have team members that could not go- be that person and bring them some stuff back! Be generous with your room accordingly! I said this in my CUGC article as well but if you can get away with not having a laptop this week- do it. But most of us will be tasked with things during the week and will have to bring it. Others should find their schedule too full to warrant carrying it with them each day. Odds are great you’ll not need one at all unless you are doing the self-paced labs. That’s a lot of ‘S’ but bear with me. I’m pretty excited that Citrix is continuing the new Synergy tradition of having Super Sessions with some true heavy hitters outside of the technology world. In the announcement at https://www.citrixsynergy.com/learn/keynotes/super-sessions.html you’ll find that Synergy 2018 will feature Dr. Condoleezza Rice and accomplished author Michael Lewis (Moneyball, The Blind Side). I’m looking forward to hearing more about their perspectives on business and technology. By the way- for those of you who know the trick of streaming the keynotes from your hotel room… keep in mind that Super Sessions will probably not be streamed! As always- what’s new in Application and Desktop delivery with a focus on the “Workspace” concept. 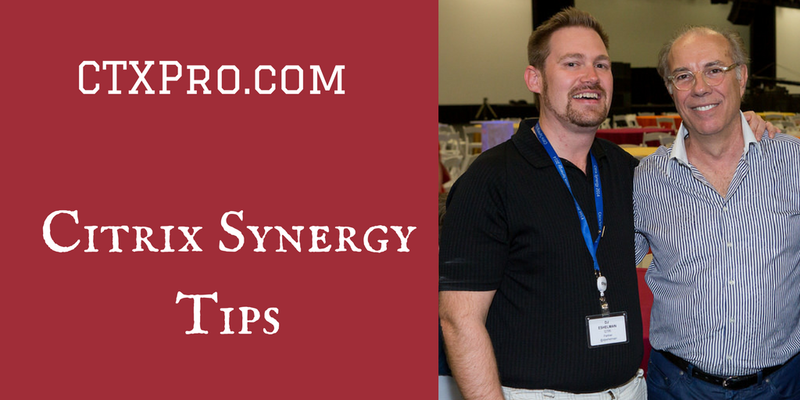 The way I think about a schedule at Synergy is very much like technology in general- I’ll optimize as things change. After the keynote, typically new products, versions and features are announced which have ‘secret’ sessions. So the key here is to remain somewhat flexible in the sessions you would like to attend. My advice? GET THE APP. It will let you know about updates as they occur, and help you keep organized. 20% Service – Find me at Lunch for Tech Talks and at CUGC events and the booth! Networking Events **Find me- I’m available! Arrive around 10 am and get settled. This is a great opportunity if you are also there early to catch up with me in person! Contact me via Twitter or other means! If you are there early, several other CUGC and other folks will be there too. 6:30 pm – 8:00 pm I’ll be helping with the Navigators Reception – if you are a first-timer COME TO THIS RECEPTION! Helping prep for Simply Serve: Battle Bots. Not kidding! Excited about Simply Serve again this year; hey- it’s for the kids! Do it! Synergy Park is open from 2 pm to 6 pm! 3:30 pm Free Certification Test – time to get updated! 3-4 pm and 5-6 pm CUGC Booth – come get a t-shirt and say hi! 6:30 pm to 11:30 pm Final Night Party- I’ve already been bragging to some of my friends in Nashville about seeing Robert Randolph and Taj Mahal! You know I’ll be there early. First, Some guides that are available to you if you are a member of the Citrix User Group Community- and you definitely should be. If not, here’s your incentive to sign up- it’s free! My fellow Nashville Citrix User Group leader Patrick Coble talks about his first Synergy as a CTP at myCUGC.org and sessions he’s looking forward to. BTW- it also happens that he had the winning design for the CUGC shirt this year! Fellow CTA Saadallah Chebaro is making the trip from UAE- here’s his perspective on Synergy. 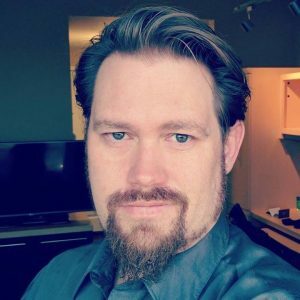 Fellow CTA Gareth Carson is making his first appearance as CTA as well, here’s his CUGC guide. Bookmark this page! 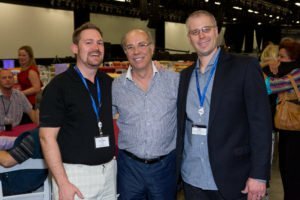 I’ll be adding a lot more content to it as we get closer to the date including some other private blogs from my fellow Citrix fanatics! I’ll be sure to email my list when I do, so join that below!